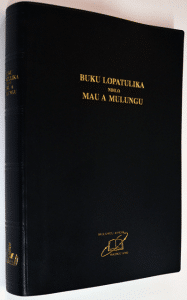 Buku Lopatulika ndilo Mau a Mulungu is the first Bible to be translated among all Malawian languages. The translation work of this Bible took over 20 years, from about 1900 to 1922. The translation work was done at a place called Kaso, Mvera in Dowa District. This work was done by missionaries from Dutch Reformed Church Mission and Church of Scotland Mission, with the help of some Malawians. Small revisions were done in 1936 and in 1966 to include cross references and section headings. Since then, no major revision was carried out. Some of the Chichewa words and terms used when the translation was first done, are very old and difficult to be understood by most Chichewa readers and speakers today. For this reason, it was imperative that a revision be made to make Buku Lopatulika more understood by its users.